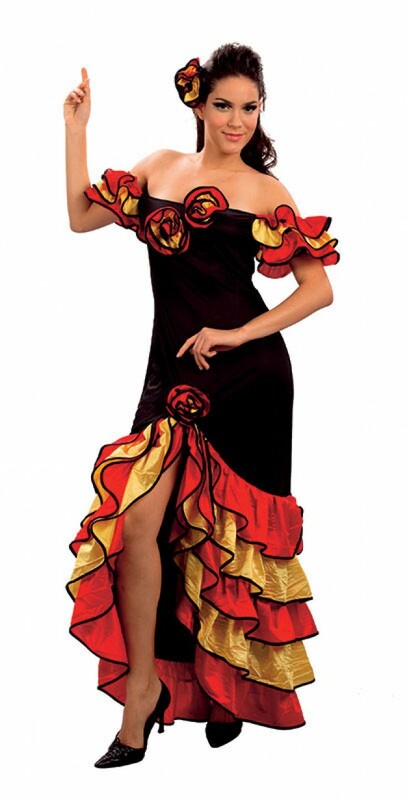 A Spanish style dancer costume which ruffled yellow and red design on a slick black dress with a matching flower hairpiece. A full length dress with a yellow and red ruffle detail and an off shoulder design, as pictured. The main body of the dress is black and the material is soft and slightly stretchy, with a sheen effect on the bright colours to create a vibrant look. The dress comes complete with a matching hair piece, on a black comb fastening. Size guidelines: One Size (to fit most) UK Size 10-14. 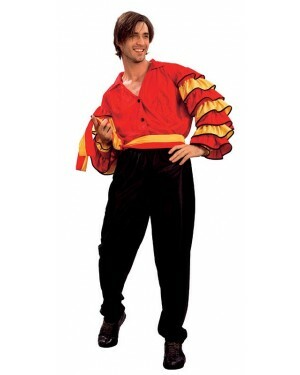 The costume is also made from stretch fabric for further sizing flexibility.